I love houseplants. I like how they look and the health benefits I'm told they provide. But my love for houseplants is in no way related to how well I can care for them. I suppose I am better than some since several of my plants have been alive for many years (the oldest is seven years old) but some aren't so lucky. I planted a terrarium (my 'how to' here) about two years ago and since then all but one of the succulents have died. What can you do? Plant new ones, I guess. I purchased a set of 20 succulents on Amazon. It was weird to buy plants online and even weirder to open a package full of styrofoam peanuts and plants, but it actually worked out great. At big box stores succulents can be $3-4 a piece, but my set of 20 succulents was (including very expensive shipping) $39 which makes each plant $1.90... a pretty good savings! BUT since I have an Amazon rewards card, I had points to put toward the purchase and my total price was only $17! Which makes each succulent only $.85! I got really excited about that, especially since plants are fickle, living things that sometimes die. 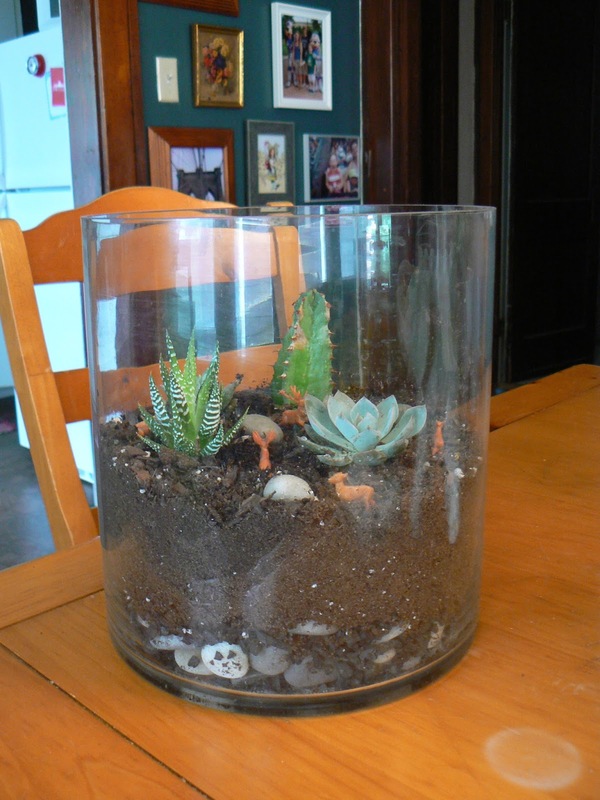 First up for a makeover is my terrarium, which has seen better days. BEFORE: It was a baby deer massacre in there. AFTER: Ah, everyone is alive and well. Recycling and resourcefulness at their best! Ha, you're right - we are the worst and we have no excuse because live only one mile apart!